1. Still the possibility of avoiding extra sporting equipment airline surcharges.....particularly with reference to Alaska Air? 2. Is there a board bag out there that allows one to avoid same....and that offers sufficient protection for an Austin? 3. A double board bag would be even better. Reading the convoluted rules at Alaska Air it looks as if the bag is less than 60 inches in length and less than 50 pounds it might be a possibility. Bottom line.....saving money and having the Austin arrive at the destination without any dings is the goal. It is a crap shoot with the airlines, or at least particular airlines. When asked I have usually call my board a boogie board or bodyboard, a name that jives with the airline's baggage policy. In recent years I have mostly flown with American and Southwest. American has gotten very itchy bitchy with luggage across the board (reminding me of United), even measuring the size of carry-on bags. I made it to/from PR (from East Coast USA) without extra board fees, just the standard first or second bag fee this past January. In March, to Costa Rica, the storm trooper charged me $150 in addition to the standard bag fee. Fortunately, the Tica smiled on my trip back and didn't charge and actually apologized for the regular baggage fee (didn't use to be a fee on flights to Central America until Feb). SWA has been a success story. Can't wait until their merger with Air Tran goes through and they have service to PR. 2. Is there a board bag out there that allows one to avoid same.... and that offers sufficient protection for an Austin? Not really. The catch is the number of linear inches, LxWxH. An Austin is roughly 50x20x3 and a board bag adds a few inches. Even a small sized, contemporary bodyboard would cut muster these days as 40x21x3 plus board bag inches. The bag I have been using on recent travels is this one -- padded with internal binding straps -- 56" x 24" x 5". Light is always better but the American Airlines check-in counter now has a sign that spells out 62 linear inches extra fees. They want your money. AA even lessened the LxWxH dimensions of the standard carry-on bag to squeeze more money out of unwitting passengers. This is borderline criminal and certainly unethical. Bottom line..... saving money and having the Austin arrive at the destination without any dings is the goal. Where are you flying from/to and what are your airline options? It is almost time for me to park an Austin at some of my regular flying destinations. Baggage fees are becoming ridiculous especially considering the length and weight and extra fee exemptions accorded golf bags. When I paid that outrageous fee for my paipo last month I saw a golf bag longer than my board bag, nearly as wide (very round) and very heavy not get charged. I was incensed! Southwest has been very, very good to me, plus no regular bag fees. American used to be very good but have charged me board fees to Costa Rica in 2 of the last 3 past years (3 yrs ago was only $70, and only going south), but not PR. I am headed to Oahu and the Big Island in October/November and have been trying to figure out which airline to fly. Alaska sounds low risk at $20 2nd bag + $50 board bag fees, and maybe even waive it for our small boards. Is that a custom paipo bag or a wake-surf bag. I bought a wake-surf bag and it takes two paipo no worries.Better than the cut-down surf board bag that I have. Hawaii late in the year - sounds like a good trip (you must have found the research funding pot of gold). There are paipo boards here on the Big Island for you to ride. I am talking to Austin about making a 45" x 22" x 1.5" quad paipo that will fit in my bodyboard bag. I may even gut a bodyboard and shove the Austin shorty inside to enhance the illusion. 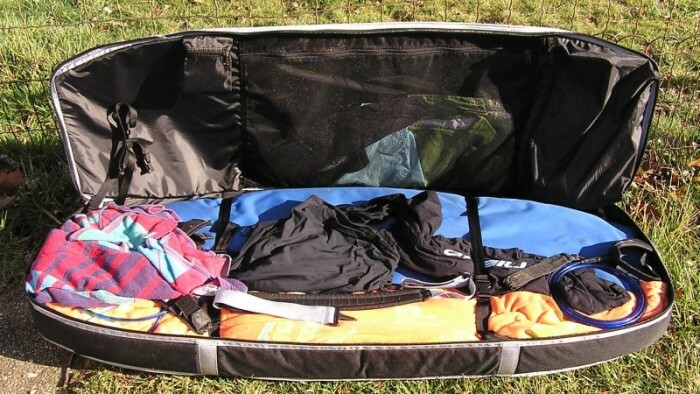 An HPD will fit in a bodyboard bag with one bodyboard. Hawaiian Airlines international flights allow free carriage of one surfboard bag in lieu of regular baggage. Hawaiian interisland flights charge around $25 per board bag for surfboards, but bodyboards ride free. No research funding... just save like a maniac! Going to the Big Island for a wedding so decided to add some time on Oahu to make the rounds. The larger bag was by Collective Development (no longer in the board bag business). It was marketed as a wake surf bag. Most of my rather extensive board bag collection consists of bags made for the wake board, knee board (water ski type) and skim board communities. Some companies now market for all of those plus surfing kneeboards and paipos. I might add that one of my 1990s bags was purchased at a discount at Surfride in San Diego County as a snow ski board gone bad -- worked fine at the time but it was an end loading bag and rather right on the sides. I have a regular eBay search routine for these bags and receive a daily email on new listings. 1. Pack the Austin in a Gorilla skim board bag. 2. The Gorilla skim board bag and a boogie board both fit snuggly in a Prolite 5'10" Fish Bag I have. 3. Fold the nose of the fish bag over and tape it securly.....resulting in a bag dimension that is less than the 62" and 50 pound limit with Alaska. So the Austin has plenty of protection.... and hopefully I am under the oversize baggage charge limit. I leave for Mexico in a couple of weeks and will report back whether I am able fly under the baggage police radar. Any wagers on my prospect for success? I leave in one week for Mexico myself. We are going to Cardon. It has two fun left points. Is that where you are going too? Yes.....my first time with a group of guys that have been previously and loved it. We are there 5/7-5/14. Sounds like I will just miss you. I see you are in Ventura. Where do you like to go out? We ever get a swell again I will look for you. I'm the grey hair guy with a clear Austin. My family and I were at Cardon last year and you are in for the time of your life. We are so excited to be going back. I actually tried to get in on the week that you are going but it was full. I normally surf the Ventura/Oxnard area on up to Carpinteria depending on swell, tide, wind, etc. If you want to hook up p.m. me and we can meet up. I want to get in the water this week a couple of times still for the exercise. The waves are long at Cardon and so are the paddles! BTW, the food is incredible too. Back from Mexico and my baggage plan worked. Austin into a Gorilla board bag......then that bag and a boogie board into a second 5'10" fish bag......folded down the nose of the fish bag and wrapped with duct tape to get under the 60" baggage requirement. Alaska took it as a regular piece of luggage so avoided the sport equipment extra fee.....and it popped out on the carousel like a regular piece of luggage. The double bagging and boogie board gave it super padding....no dings or damage.